Kenneth L. Hatch III (right) pleaded not guilty in Knox County Unified Court to 22 counts involving sexual assaults and drug-related offenses, Aug. 23, 2016. He is represented by attorney Richard Elliott of Boothbay Harbor. 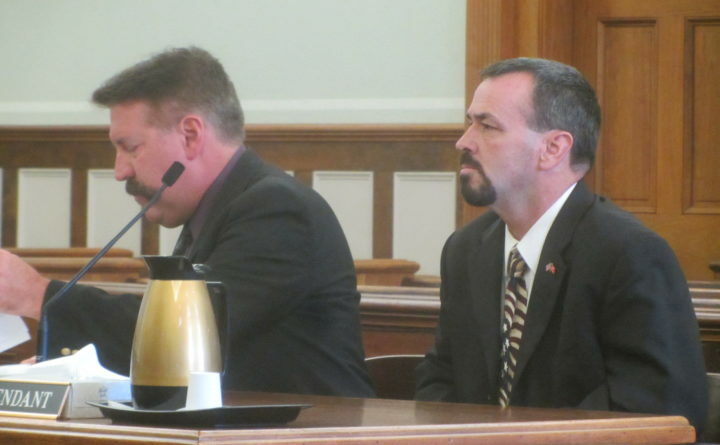 The trial of a Lincoln County sheriff’s deputy charged with sexually abusing three minors on more than a dozen occasions is slated to begin Monday in Kennebec County Superior Court in Augusta. Kenneth L. Hatch III, 47, of Whitefield has pleaded not guilty to 11 counts of sexual abuse of a minor, three counts of unlawful sexual contact and eight counts of aggravated furnishing of marijuana. The drug counts allege that Hatch gave marijuana from a bag marked “EVIDENCE” to two of his three alleged victims, two of whom were 14 or 15 at the time of the alleged assaults. The alleged sexual assaults against the third victim, which resulted in Hatch’s arrest in June, reportedly first occurred in 2004 when she was 6, Assistant Attorney General John Risler, who is prosecuting the case, told the grand jury in August. The indictments allege that Hatch then sexually assaulted the same girl and provided her marijuana in 2013 and 2014, when she was 14 and 15. A jury was seated Wednesday in Augusta, and the trial set to begin Monday morning. Hatch and Elliott both told Stokes on Wednesday that no plea agreement had been discussed because Hatch indicated he was not interested in a plea. Stokes also granted a motion by Elliott to sever five of the charges that allege crimes against two victims from the other 17 charges that allege crimes against a third victim, because Elliott said Hatch might testify on the former, but not the latter. Stokes’ ruling would have still allowed the victim in those 17 charges to testify about what allegedly happened in Hatch’s cruiser, so Elliott withdrew the motion. Hatch was placed on paid administrative leave after his arrest in June, but his status was changed to unpaid leave after the grand jury indictments. Hatch joined the Lincoln County Sheriff’s Office in 1999. He was named its Deputy of the Year in April 2016.